Equipment 30 LC DBM Trenchers Boring Machines See ad on page 52 Information Request # 9232 Barreto Mfg. www.barretomfg.com 800-525-7348 Low maintenance and hardworking, track trenchers are reliable in the most difficult conditions. The simple steering, large tracks, and trencher size make the operator's job simple and keeps your customer satisfaction high. With accessible yet protected components, maintenance costs are minimal. See ad on page 52 Information Request # 9233 UnderWunder www.underwunder.com 877-968-2673 Our machines weigh in at 96 lbs. and are specifically designed to be transported without the use of a trailer. Our bits are three-bladed and have leading carbide tipped edges arranged in a serrated pattern. Water is used to keep the bits cool and to create slurry. 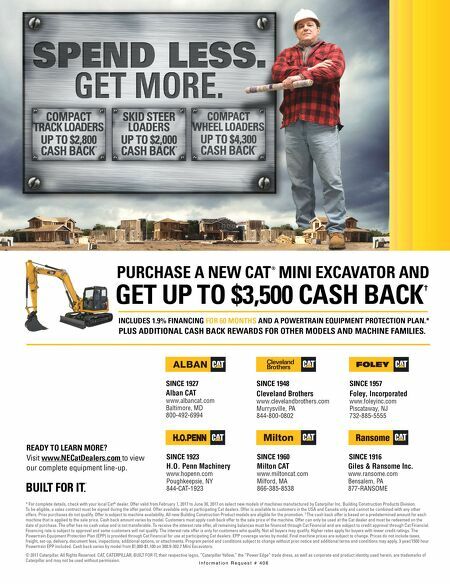 See ad on page 47 Information Request # 9234 SiBore Drill www.siboredrill.com 330-844-0042 SiBore's new SB2-16 HD has a heavy duty main shaft and HD augers from 3" - 8", Honda GX35, 4 stroke engine, capable of boring up to 16'. Two year warranty. 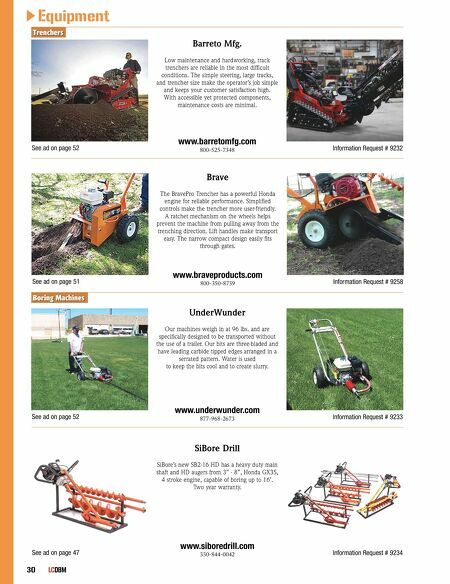 See ad on page 51 Information Request # 9258 Brave www.braveproducts.com 800-350-8739 The BravePro Trencher has a powerful Honda engine for reliable performance. Simplified controls make the trencher more user-friendly. A ratchet mechanism on the wheels helps prevent the machine from pulling away from the trenching direction. Lift handles make transport easy. The narrow compact design easily fits through gates.